China's President Xi Jinping, left, shakes hands with Britain's Prime Minister David Cameron, during a joint press conference in 10 Downing Street, London, Oct. 21, 2015. Britain and China have signed deals worth more than $60 billion during President Xi Jinping's state visit to London. The Chinese state-owned National Petroleum Corporation and British oil giant BP are participating in the development projects. Speaking to reporters after a second day of meetings with his Chinese guest, Prime Minister David Cameron said Britain and China also were signing a deal to finance a nuclear power station in southwest England, a sign that both countries wanted to take their ties to a "new level." The two sides also discussed the excess of steel global supply — Xi said Beijing had taken steps to reduce capacity — and reached a new deal on tackling cyber espionage, he added. Cameron's office also announced Wednesday that from 2016 on, new visitor visas for tourists from China would be valid in the country for two years, which will bring "significant benefits to the UK economy." Cameron said Britain could not have a "frank" discussion with China about issues such as human rights if it did not have a strong economic and trade relationship with the country. Speaking alongside Cameron, Xi addressed the issue of his country's human rights record, saying China had "found a path of human rights development suited to China's national conditions." Human rights advocates have planned protests throughout Xi's visit. The group Freedom Now, which represents detained Chinese Nobel laureate Liu Xiaobo and his wife Liu Xia, released a letter Tuesday written by 12 fellow Nobel Peace Prize winners urging Cameron to call for China to set the pair free. The laureates, including Desmond Tutu and the Dalai Lama, also ask that Cameron push for Liu Xia to be allowed to travel abroad for medical treatment. Queen Elizabeth hosts Chinese President Xi Jinping and his wife Madame Peng Liyuan at a state banquet at Buckingham Palace, London, Oct. 20, 2015. 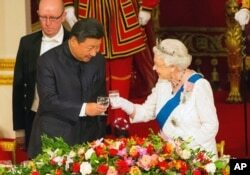 On Tuesday, Xi addressed Britain's Parliament and was greeted by Queen Elizabeth during a lavish ceremony. His four-day trip will also include dinner at Cameron's country retreat and visits to businesses.